Ministers order BDS activist Lydia de Leeuw to be denied entry into Israel. 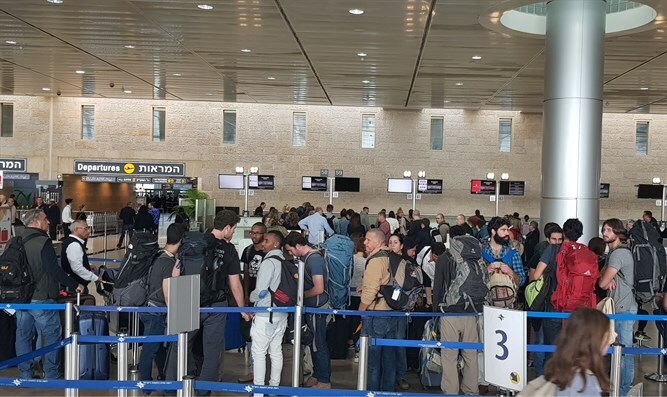 Public Security Minister Gilad Erdan (Likud) and Interior Minister Aryeh Deri (Shas) on Friday ordered BDS activist Lydia de Leeuw not to be allowed into Israel. De Leeuw, a resident of Holland, was involved in several BDS Nederland activities. She works to de-legitimize Israel and promote boycott of Jewish State, actively participating in pro-BDS protests and speaking frequently at BDS events, openly calling for a boycott of Israel. "Whoever works to promote a boycott of Israel and harm its citizens has no reason to visit Israel," Erdan said. "The rules have changed, and like every normal country, Israel will not remain silent in the face of those who attempt to harm us." "I will use my authority to bar entry into Israel for anyone who wishes to harm the State," Deri said. "This woman consistently works to boycott and harm Israel, and therefore I prevented her entry." "This is also what we will do in the future when dealing with boycott activists who attempt to enter Israel," he promised.